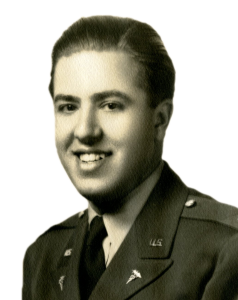 Today we left at 7:00 A.M. and when we stopped for gas at 8:30 A.M., Roy went to a phone and soon who did we see coming towards us in an ambulance, but Paul Stratte. Gee, we were all sure glad to see him, and vice-versa. We had quite a chat with him while the boys filled the trucks up with gas and oil. Had lunch that day at Oujda and it was plenty hot. It was there that we had to change our watches an hour ahead. We had to stay there for an hour and a half because the bloomin’ water point was quite a little ways off the main highway and we definitely needed water. The water and gas situation all along was a headache because for some reason or other they never seemed to have the two near to each other – utterly stupid, for it certainly wasted a lot of time for the various convoys. 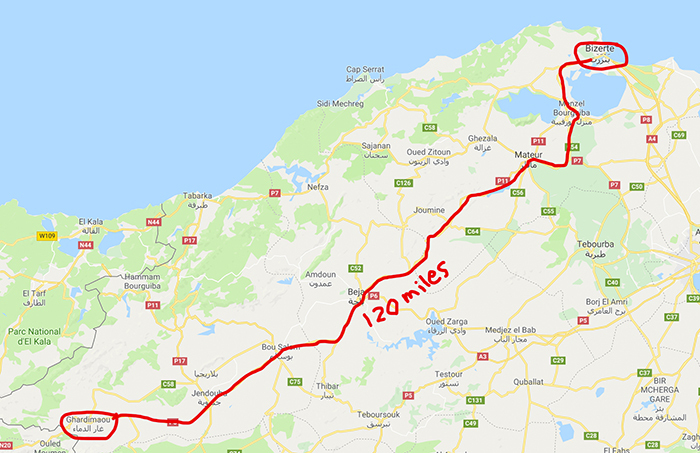 We were going to stop that second night at a little town of Tlemcen but as it was only 4:30 P.M. when we got there we persuaded Roy to have us go on to the next place, despite the fact that the boys from the 8th were kicking some, because they thought we were driving too many hours during the day. One of their officers was just getting over a pilonidal cyst and the sitting was apparently sort of tiresome for him. But our boys were in good spirits and figured there was no sense sitting around a little dump in the heat when it was considerably cooler riding. So, we went on to Sidi Bel Abbes that night, arriving at 7:00 P.M. This time we were quartered in an old racetrack. There they had water and latrines all set up and it was pretty good. Again, it was too hot to put up pup-tents, so again tied to the truck with netting, and slept comfortably. 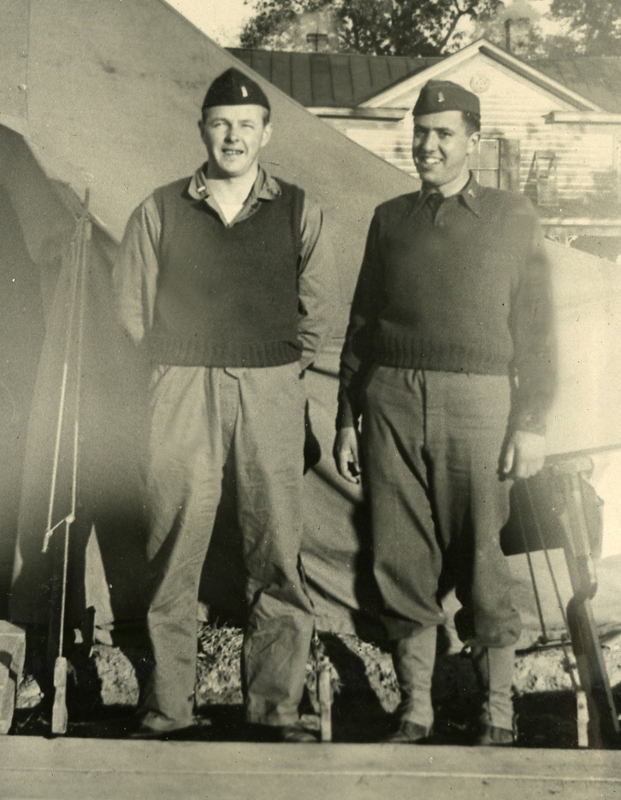 When the convoy stopped for gas, René ran into Paul Stratte – shown here together at Camp Pickett, Virginia back in the fall of 1942. June 22, we left at 6:25 A.M., and this was our shortest day, for we only traveled 205 miles, having gone 239 miles the second day. The reason we stopped early (4:40PM) this day was that we had some tough hills on the next stretch and we didn’t want to be too tired. We were ahead of schedule and a lighter day was welcomed by some. We stopped at a place called Affreville. What a place! The bivouac area was in what was apparently an Arab marketplace – there was water, not drinking water, and plenty of bloomin Arab urchins around. We had quite a time keeping them away. We were right next to a French garrison of native troops and some of the troops came over and visited, and we carried on quite a conversation with some of them. They were spellbound when Peter turned on his radio, and it was all we could do to get them to leave when we wanted to go to sleep. We had to do it politely, so with our meager French, it was plenty difficult. However, we finally got to bed – this time I slept in the truck and Roy slept on top of the trailer. The truck was very comfortable, I found. Today we left even earlier, at 6:15 A.M. and I drove over the tough winding hills. There were really some tough ones, hair-pin turns and all. Of course, with those trucks and the load, one couldn’t go over 15 m.p.h. up any of those good inclines. With the road rather narrow, and oncoming traffic every so often, it was quite a little job. I had gotten into the habit, ever since the first day, of riding with the gun-turret cover off, so that I could jump up on the seat and see what was going on behind us – how the other trucks were following, etc. Roy, after that first day, stayed in the rear except through cities and when we came to control points, gas points, etc. As a consequence it was up to me to see that we didn’t outrun the rest of the trucks. When we were going around turns it was sort of difficult — for we would only get a glimpse of one or two trucks every so often if we were going in the opposite direction from them around a canyon wall, etc. When I was driving, the fellow with me stood up and told me what was going on. Yes, we had quite a system. This was especially useful in passing other trucks or convoys, for I could see ahead of the other trucks – i.e. over them, and could tell whether we were going to get stuck or meet opposition or whether it was safe to pass. I could also motion our other trucks on in the same way. We had quite a time passing some of the convoys – actually we weren’t supposed to pass other convoys without special permission, but as we were a small convoy and could travel, therefore, much more rapidly than most, it was silly for us to stay behind one that we could very obviously and easily pass. The British and French convoys, especially, traveled slower than we did, and, as luck would have it, we seemed to meet them on the turney-twisty roads. It was then that riding in the turret really came in handy. That fourth day we passed quite a strange British convoy, one that seemed to be made up mostly of smoke producers. 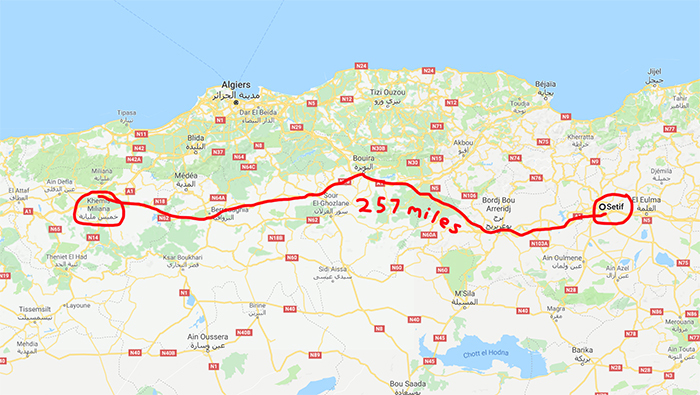 We landed in the town of Setif at 7:30 P.M. that evening, having traveled 257 miles. The bivouac area was pretty nice. It was a great open field that had latrines and a few small round domed huts. By these huts there were faucets and stands where one could wash very conveniently. There was also good drinking water from a faucet. That night many of the officers slept in one of these buildings, but Roy and I stuck to the outdoors. Roy in his trailer-hut and me in the truck with Jim Hamilton. 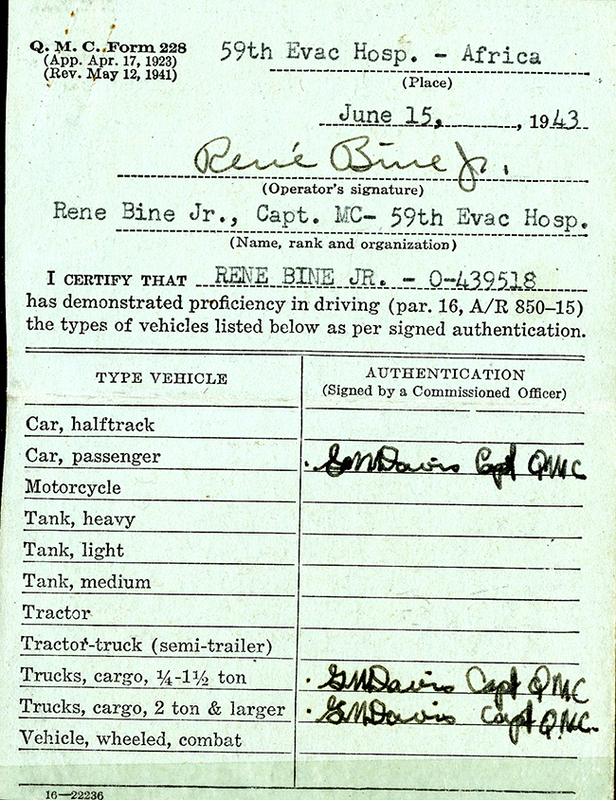 René is making good use of the truck license he got just 5 days before the convoy of Cohn’s Courageous Commandos drove away from the rest of 59th Evac Unit in Casablanca. June 24 we left bright and early at 5:25 A.M. Roy would always tell us the night before at what time we were expected to pull out and then, long before that time would arrive in the morning, he would be prancing around like a caged lion hurrying everyone up so that, in the end, it turned out that we would be leaving anywheres from 15 to 45 minutes ahead of schedule. But, that is Roy — he’ll never be different. Some of the guys moaned a bit about this, but for my part, I was all for it. Some of the time, Roy would give instructions to me that I would misinterpret and naturally catch hell from him. Then at other times he would try to signal what he wanted us to do and his signals were not explicit enough or were confusing, so that we would end up where he did not want us. But all in all we got along very well. I certainly think that it was no little feat to bring a convoy like ours that great distance with inexperienced drivers, none of whom knew anything about convoy driving, over roads about which no one knew anything — to bring them all that distance without the slightest mishap to vehicle or personnel, and to do it in record time. Yes, I think that not only Roy, but all the drivers deserve a great deal of credit. That fifth day was quite a day. We were on the road for a little over 15 hours and yet only traveled some 242 miles. Reason: we ran into plenty of traffic and it rained some when we were way up in the mountains. At two different points, British Bren-gun carriers (long flat trailers) skidded in the mud and had a devil of a time getting back on the road. The second one actually turned over and managed to block the passage for a long string of trucks that were both in front and behind ours. We had to stop and wait for them to clear the road, and it was most annoying because of the heat, the long hours, etc. When one is on the go it isn’t bad, but if one has to wait somewhere in the middle of a trip like that, it gets awful annoying. One of the interesting things we passed that day, and also on some of the other days, were the convoys of returning prisoners. One rarely saw a guard with them. There would be whole truck-loads of prisoners and the only allied soldiers would be the driver and perhaps one guard for every two trucks. No, neither the Italians nor the Germans were at all anxious to part company with the trucks that were eventually taking them to the U.S. Can’t blame them, can you? We talked to some of the guards when one of their convoys was stopped along side of ours, and they said that when they stopped for rest, they never had to look around for the prisoners to be sure they were all back in the truck; for, if they started out without a couple of them, the prisoners would come running and yell so they could climb back aboard. At one place we bumped into a fellow who had been guarding some 30 prisoners, and when he counted them the next morning he somehow found that he had collected 18 more during the night for the count was then 48. At the end of the fifth day we found ourselves in the little town of Chardiman or something like that. [Probably Ghardimaou] The only field we could find to bivouac in was pretty well fertilized and was rather bumpy. But finally we found a portion of it that was not so bad and all hit the blankets early – Roy again on the trailer and me in the truck. Today was an especially long day due to traffic and rain in the mountains. Also, René notes, “At two different points, British Bren-gun carriers (long flat trailers) skidded in the mud and had a devil of a time getting back on the road. 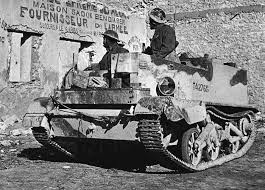 The second one actually turned over and managed to block the passage for a long string of trucks that were both in front and behind ours.” Pictured above is a British Bren-gun carrier. On the last day the convoy didn’t leave so early, getting our start only at 7 A.M. From there on in we began to see plenty of interesting things — bomb craters, cemeteries, and German, Italian and British tanks, trucks, etc. wrecked by the side of the road. There was very little British equipment and much less American equipment — apparently all of that had been hauled away already. But boy there were plenty of German tanks, trucks and planes to be seen. We passed several parties of prisoners working on the roads and they seemed to be doing a good repair job under the supervision of only one or two guards to any large group. 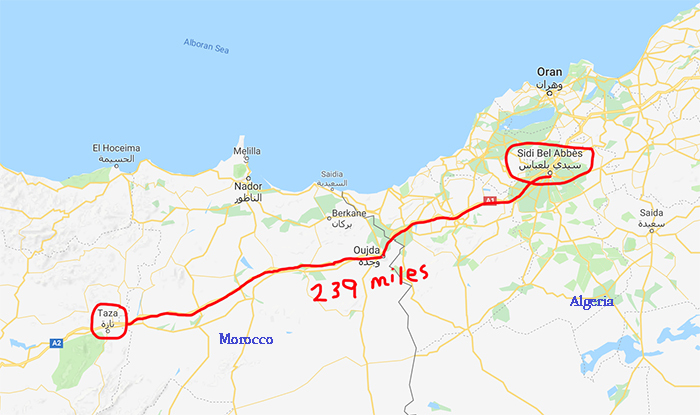 We got to Bizerte shortly before 1 P.M. and when Roy inquired as to where we were supposed to go, the MPs as usual knew nothing at all. So, he had to wander around town until he found some sort of a headquarters at which he could get some information as to where the man was to whom we were supposed to report. While Roy was doing that hunting, we parked on a side-street and broke out the lunch. What a place Bizerte is — there is really nothing left of it. There can’t be more than fifty of the natives living there anymore — there isn’t one house that is anywheres near intact — and we saw all this those few minutes we were there. Our bombers really did a job there, and strangely enough they managed to miss the places that later were important for us, i.e. the harbor installations, barracks, roads, etc. Yes, those boys are O.K. Finally Roy came back and led us to the place we were to stay. It was right on the water-front in what used to be a hangar. There was plenty of evidence of bombing there, with mostly French and German wrecked planes all over the place. However, some semblance of order had been made and the wreckage was pretty well piled up in specific spots. We were given cots and the boys quickly set about putting them together, putting up their mosquito netting, and sweeping up the place. They really went at the work in a hurry – none of that gang afraid of work! Some of the boys made a bee-line for the water for a swim, but I kind of stuck around in the hangar to help get things organized, as Roy had gone off to find out all the dope he could. That evening we got a pretty good idea of what our duties were going to be. We saw some of the ships upon which we were to be put, and anticipated plenty of action. We were told to arrange things in groups of three men to one officer. Roy, it was decided, was to rather arbitrarily pick the men for each officer. He picked the cream of the crop for himself, but as all the boys that we brought with us are top men, it really worked no hardship on anyone. 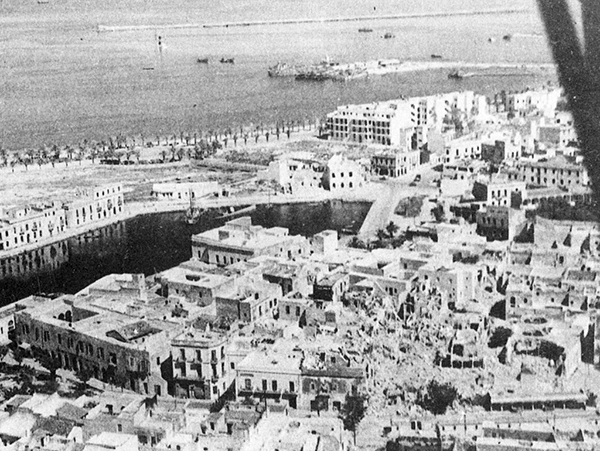 Despite the fact that we had been told that they had been having nightly air-raids, we were completely un-disturbed that first night in Bizerte. 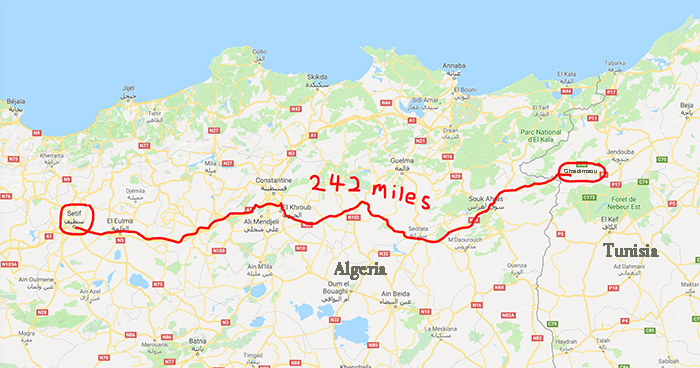 Cohn’s Courageous Commandos covered 1,312 miles on their 5-1/2-day journey from Casablanca, Morocco to Bizerte, Tunisia. 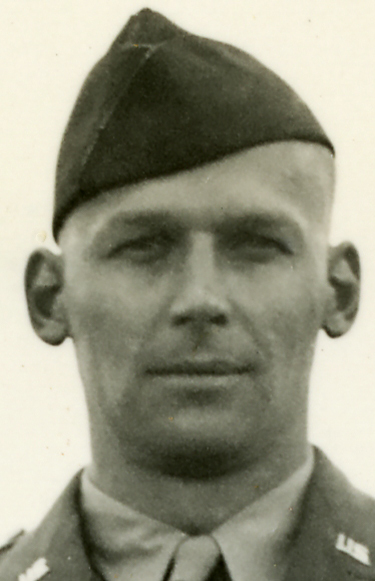 On the 26th, we loafed around and I turned in the extra rations we had and the quartermaster equipment. I got to see some more of the town that way and found it all the same – a total wreck. That afternoon we went swimming at a beautiful beach that was about seven miles or so from Bizerte, but to get there it took about 40 minutes because it was over a terrible road, through a couple of creeks, etc. But, boy, it was worth it. The sand was like Carmel, clean and white, and the water was a beautiful greenish-blue — calm, clear and no waves at all. It was really warm water — in fact almost too warm. Golly, it was really nice. We had brought two trucks down to the beach, one with men and the other, officers, and all were reluctant to leave the beach. That night we were assigned an air-raid shelter that was about a block and a half from our hanger. 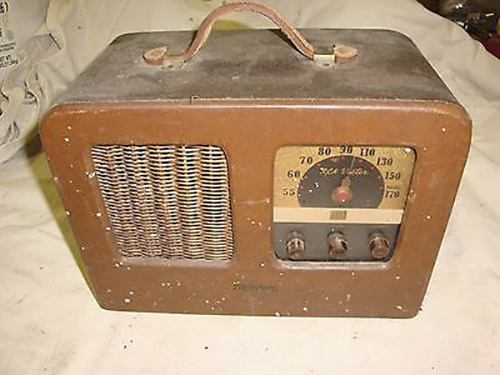 And, during the night, sure enough, came the air raid alarm. We dashed for the shelter and somewhere along the line the “all-clear” came but as we weren’t used to it, and in fact, hardly knew what to expect, we missed it, and waited around in the shelter until Roy was able to get more information. Then a few hours later, the second alarm came and we hi-tailed it to the shelter, which was built underground and which smelled rather poorly. We all vowed that if another alert came we were going to remain in our beds, and to heck with the shelter. We were eating at a Navy mess on shore and though it was certainly a relief after the meals we had had en route, it was far from good, being strictly altered C-ration. An un-exploded bomb from the air raid the night of June 26th. 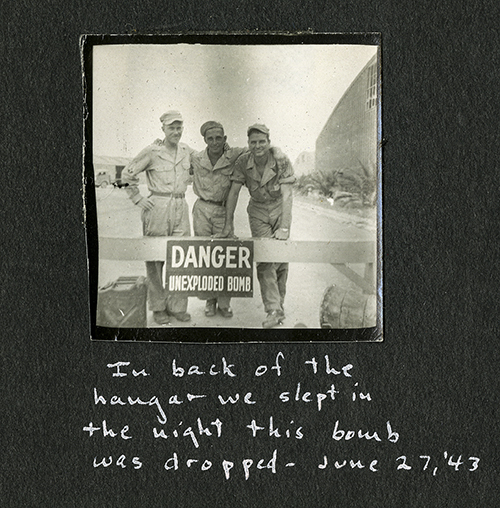 On the 27th, I took 3 of the trucks and the jeep in to the Ordnance office and turned them in. Then tried to find the dope on getting the men paid, but was unable to find anyone who knew anything about it. When I returned, I found I was scheduled to board a ship that afternoon with my men. 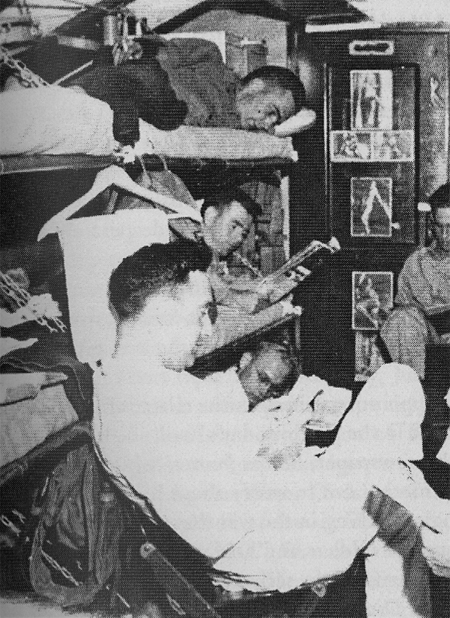 The 8th men also were to board theirs, and Eddie Welles, also, but the rest weren’t assigned yet. Naturally, I got my things together, prepared to store most of the stuff and take only barracks bag (an extra one I had) and musette bag aboard with me. In the afternoon, we piled into what is known as an LCT, and were taken out to Lake Bizerte where all the ships were anchored. On the ship (the 386) I was given swell quarters — a bunk with an inner spring mattresses — a lower, with no room-mate at the time. The room had a desk, a shelf, hangers, and what was more important, a fan. It was luxury itself. I had nothing to do on the ship except get acquainted with the Pharmacist Mate and the supplies that were already on board, and get acquainted with the officers and men. Carl, Bernie and Al Querhammer made themselves acquainted and settled in the crew’s quarters. 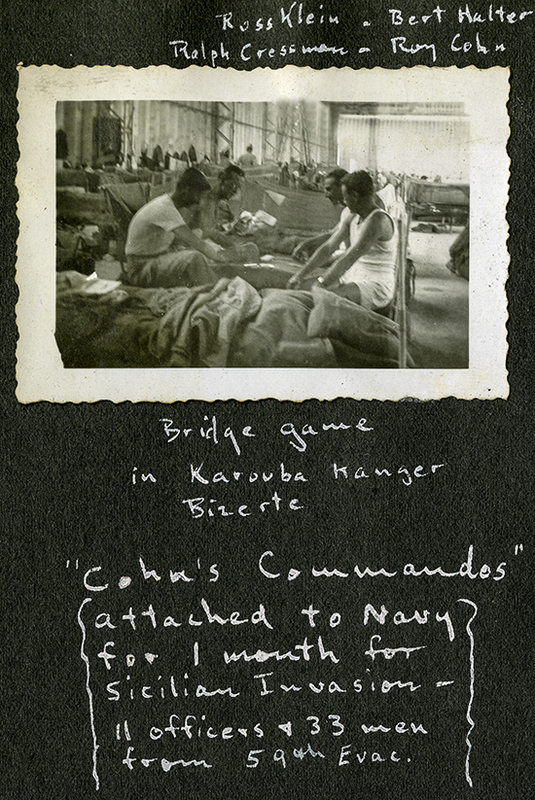 They had canvas three-decker bunks on the “troop compartment” deck, where it got awfully hot during the daytime but wasn’t so awful at night. As soon as we got aboard, the difference in food was noted. It was good food well prepared and we had swell fresh bread that was made right on the ship. One day we even had chocolate ice-cream which, though flaky, was cold and most welcome. We had lemonade, iced, as often as we wanted it and on one occasion one of the colored mess attendants even brought a glass full of the lemonade out to Q and me while we were standing out by the rail. As our ship was scheduled to carry pontoons, the load of vehicles that we had on the top deck already had to come off, and as a consequence we were in at the dock considerably more often during the next week than were the other ships. 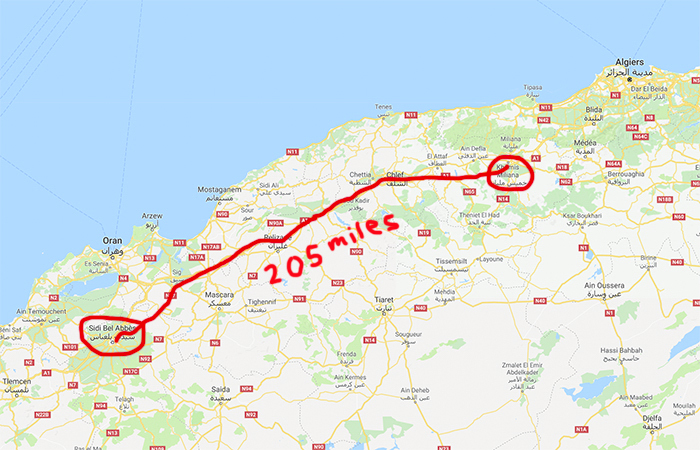 I naturally spent some of that time with Roy and the rest, but on the 2nd that gang up and left and went to Tunis where they were to get on the LSTs that had been assigned to them. That left Eddie and myself as the only 59ers up at Bizerte. I saw Eddie a couple of times, but as his ship was out on the Lake most of the time, we didn’t have much of an opportunity to really get together.